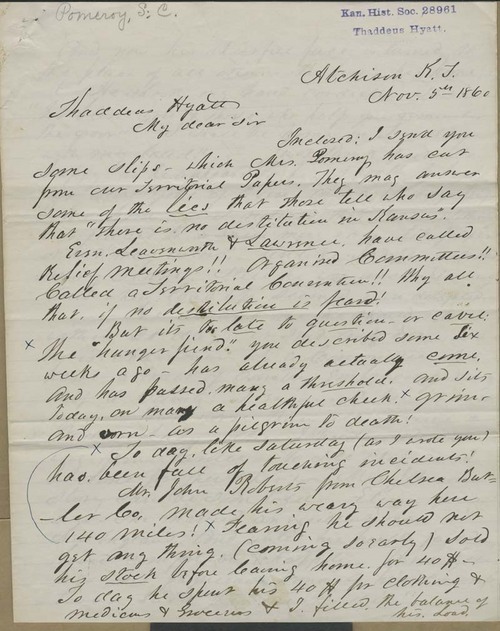 This letter, written by S. C. Pomeroy from Atchison, Kansas Territory, sought to inform Thaddeus Hyatt, president of the National Kansas Committee, of the destitution in Kansas. Pomeroy was keeping Hyatt apprised of the dire situation, and he spoke of relief committees being formed in Leavenworth and Lawrence. Pomeroy also related the tales of specific individuals, such as John Roberts from Chelsea and Mrs. Johnson, a widow with five children.